Mohoho'ijwe, buboriano'e, vee'i ija ahe, bumare edwee, siha'e, visuano'e, bureji sor'e ohu'o vavodeje ja'e. Small black parrot, beaks of Blyth’s Hornbill, tailbone of the lizard, gourd-shaped orchid leaf, fruit of the Sihe tree/tattoo design of the bellybutton, teeth of the fish, leaf markings on the woven mat, and bush rope (jungle vine with red flowers). The lines that run through the work are known as orriseegé or ‘pathways’ and provide a compositional framework for the design. The spiral design is known as möhöho’ijwe, representing a small black parrot found within Ömie territory. The zig-zagging triangular designs are buborianö’e, the beaks of Blyth’s Hornbill (Rhyticeros plicatus). Hornbills are the largest flying birds that can be found in the Ömie mountains. During the times of the ancestors hornbill beaks were a part of men’s customary dress for rites and ceremonies. The beaks were worn in rows radiating outwards around the rim of men’s foreheads beneath their feathered head dressess. The beaks beautified men but more importantly, because the hornbills are such large birds and are so extremely difficult to hunt, they were indicators of a male’s hunting skills and therefore symbols of prestige. In one version of the story of how the first people emerged onto the surface of the earth from Awai’i underground cave, a man used his hornbill beak forehead adornment as a tool to chisel his way through the rock and into the light of the world. The slanting square design at the top and bottom of the work is vë’i ija ahé, the tailbone of the lizard. The cone-shaped design is known as bumare edwé, representing an orchid leaf that is a similar shape to a gourd. The small triangles are vavodeje ja’e, a bush rope made from a vine that has red flowers. The diamond design is siha’e, a yellow fruit known as sihe that is found in the rainforest and often eaten by cassowaries. In the time of the ancestors during times of tribal warfare, the Ömie male warriors had no food while they were defending their borders in the forest far from their villages so they survived by chewing the sihe fruit, swallowing the juice and the theywould spit out the pulp. The siha’e design is often associated with or even called vinohu’e, the tattoo design of the bellybutton. The chevron/arrow design between the siha’e design is visuanö’e, representing the teeth of the mountain fish. 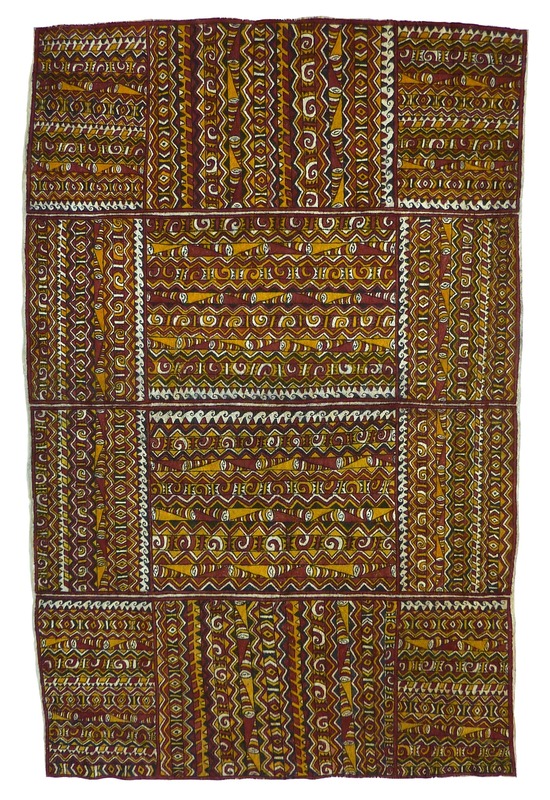 The very small black triangless are bureji sor’e, which is an ancestral design originally inspired from a naturally occuring pattern found on the dried pandanus leaves of traditional mats. This pattern is thought to be created by an insect and is much admired.